WARNING! Photo of meat below. Poor turkey. Yesterday was Thanksgiving, and I had already decided that I was going to eat meat for the holiday. I’m really glad because the only vegan dish served for lunch at my Aunt’s house was Brussels sprouts. Of course, I would have planned ahead and made or brought something vegan for myself and everyone else to eat, but I’m not quite ready to have the “I’m trying to go vegan” talk with the extended family just yet. Lunch consisted of a small piece of teriyaki chicken, four lumpia shanghai (those suckers are gonna be tough to give up), a piece of roast pork, Brussels sprouts, and white rice. Dessert was a no as all the options contained dairy: buko pandan, pumpkin pie, and sweet potato cake. I felt sorry for myself for a minute, but then thought about all the calories I wasn’t having and immediately felt better. 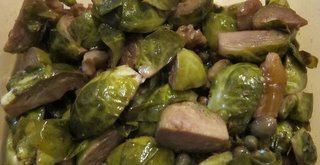 Mom made the Brussels sprouts using a recipe that she saw on The Chew. They were freaking delicious. Check out the recipe – it’s straightforward and yields great results. 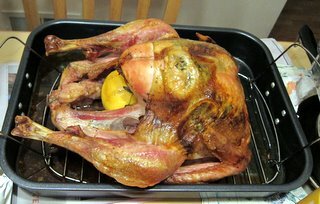 She also prepared the turkey using a recipe that she saw on The Chew. 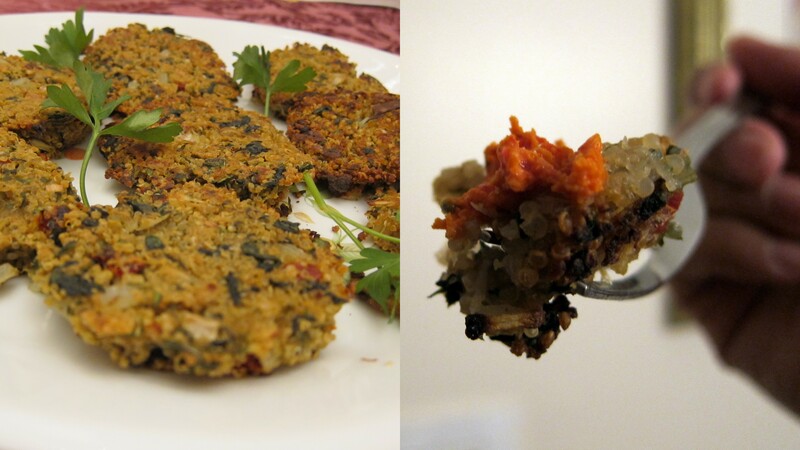 For my contribution, I made quinoa potato cakes using a recipe I found on Vogue Vegetarian. People, check out this blog! The Vogue Vegetarian has some amazing recipes. I veganized the recipe by using instant potato flakes and about a 1/4 cup of water instead of an egg. They turned out pretty tasty, along with the roasted red pepper sauce. I like quinoa and really appreciate how nutritious it is, but I’ve had a hard time really enjoying it. I think it’s because I’m so used to the texture and size of jasmine rice. Packing the quinoa in a crispy cake like this is a genius idea. I can see putting the entire mixture in a dish and making it a quinoa casserole. I can’t wait to try this again with different ingredients. I’m already thinking of adding corn and tiny raisins to it. I think the cumin was a turnoff for some. I’m thinking that they would probably taste OK without the cumin or by replacing the cumin with something else. At any rate – it’s vegan, soy-free, and the quinoa cooked perfectly in a rice cooker. Yay! For dessert, I was able to enjoy a slice of pecan pie. I was a bit annoyed that it wasn’t totally vegan (egg in the crust), but was super happy that it was dairy-free. In fact, I got through the entire day without having any dairy and I don’t feel like I missed anything at all. Hope everyone had a wonderful Thanksgiving and ate lots of veggies! The quinoa potato cakes sounds fantastic! Combines two of my favorite things 🙂 Thanks for sharing the link to the recipe, I’m going to give these a go! The cakes must be delicious! I am thrilled you tried the Quinoa Potato cakes and glad you liked them! Would love an update when you try them again, with changes. Really interested on what you do and how they turn out. Also, you can completely eliminate the cumin if you don’t have a taste for it. They will still turn out flavorful and I don’t think you’ll have to substitute anything for them. Thanks again for the trackback and review!